Welcome to our first installment of The Spoonflower Seller Handbook! 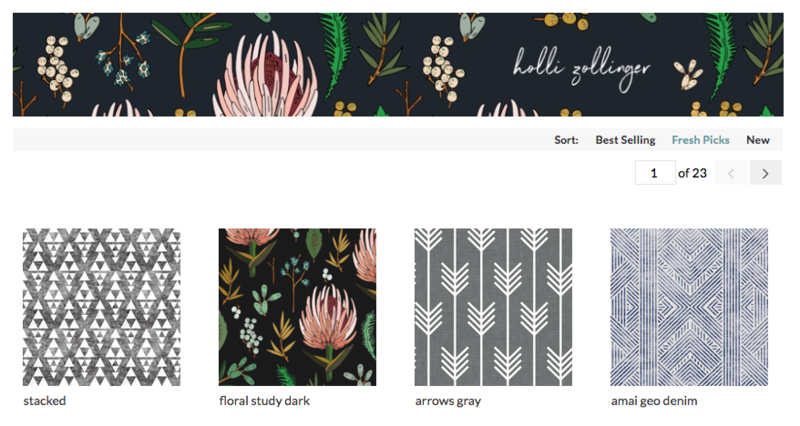 A digital marketing series on how Spoonflower sellers can better promote themselves and stand out in a marketplace that’s growing by the minute. Think of this as a toolkit of strategies and tips you can bookmark and reference as needed. 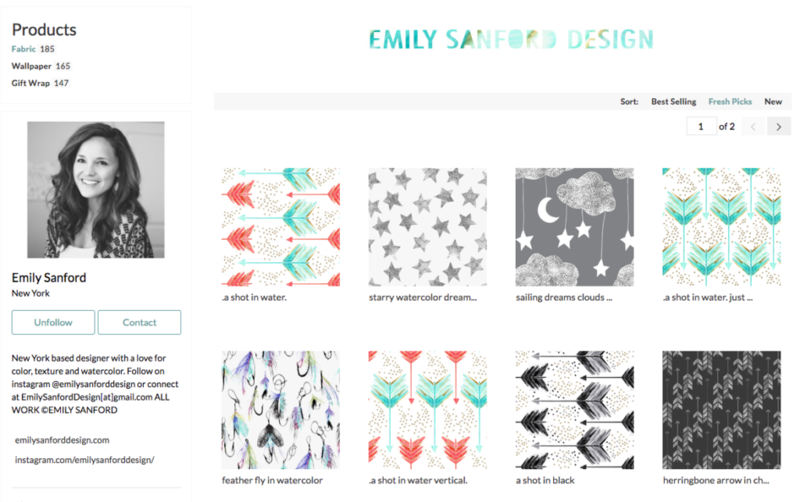 At the end of this series, you’ll be fully equipped for seller success both within the Spoonflower platform, on social media, with your product photography and beyond. You’ll also understand how to go about building relationships with small business owners and makers who may want to use your designs for their one-of-a-kind products. 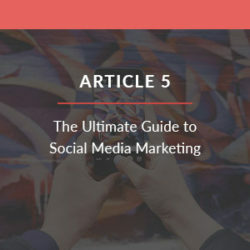 Before we get into things like how to tackle your branding and social media strategy, let’s back up and start with the basics, shall we? 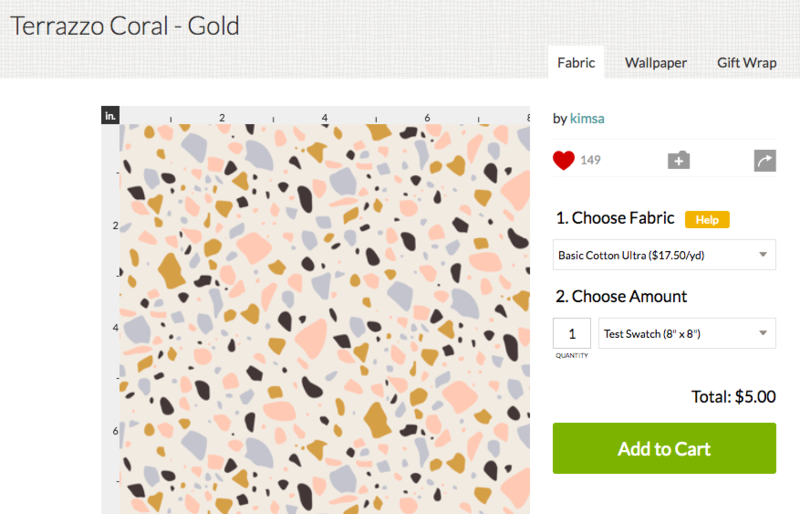 So you’ve uploaded your designs to Spoonflower, ordered proofs, and you’re happy with the repeat and the colors. YAY! But wait –your work is not yet done. Make sure you’re following these four tips to ensure your designs are set up for success. 1. Give your design a search-friendly title. 2. Write a description highlighting your design. Remember to keep it under 150 characters and leave the HTML at home. Use your description as an opportunity to elaborate on the colors and the techniques used to make the design. 3. Add up to 13 design tags. 4. 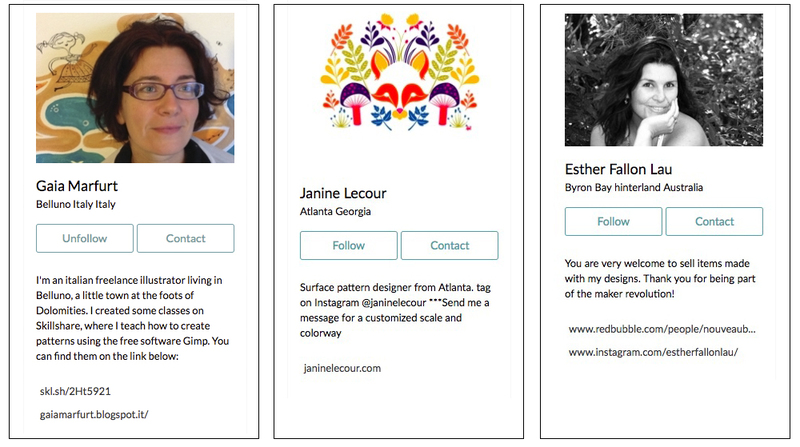 Opt-in to our distribution channels so customers can find your designs on Roostery, Amazon, Etsy and Ebay. Learn even more about how to optimize your design and the advantages of Spoonflower’s distribution channels here. One thing that many designers overlook but is incredibly important: your storefront! Specifically the shop banner and bio. Let’s start with your banner. For many shoppers this will be their first impression of you as a designer so it’s important to incorporate as much of your branding as possible. Do you have a logo? This is a great place to put that. Choose colors that are consistent with the overall look and feel of the designs in your shop. Is your Spoonflower shop filled with bold, saturated vector-based animal illustrations? If that’s the case, then you probably wouldn’t want a pastel painterly watercolor banner. Cohesion is your friend! In addition to making a great first impression with your branding, the shop banner is also an opportunity to direct shoppers to take a specific action. 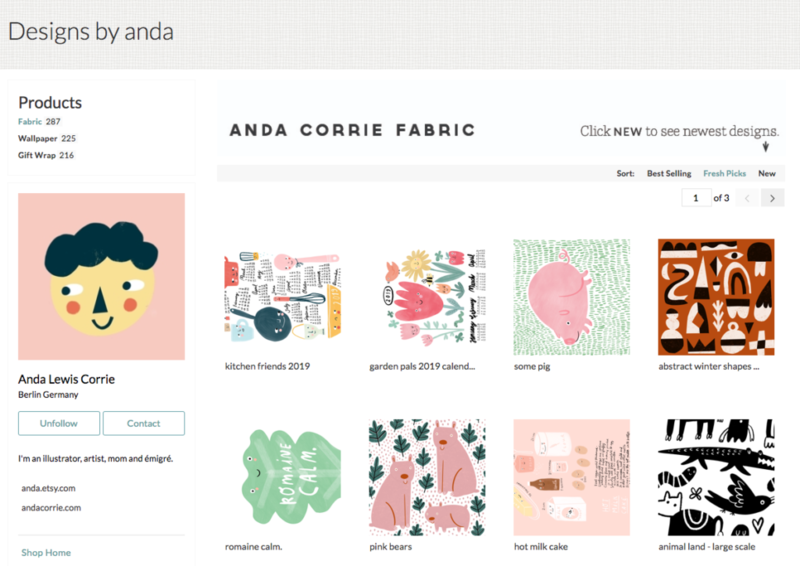 Consider this clever example from designer and author of The Spoonflower Quick-Sew Project Book, Anda Corrie, who encourages shop visitors to check out her newest designs by adding a strategically-placed arrow and CTA (call to action) right inside her banner. The next key ingredient in a successful storefront is your shop image. Your shop image is the 250 pixel box on the left-hand side of your shop page. This is the perfect spot to add either a photo of you (looking like your most warm and approachable self!) or a self-portrait. The more you can humanize your shop and give it personality, the more memorable you become and the more you’ll stand out from the crowd. Speaking of being memorable, do not skip filling out that 160 character “about me” section! There’s so much key info you can pack into this small space. Many designers use it to share their Instagram handle and remind shoppers to tag them in their project posts. Other shops use it to let visitors know whether they are available for custom requests and collaborations. 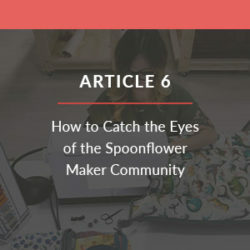 You can even say a little bit about where you come from and use the opportunity to promote your work outside of Spoonflower – such as classes you teach on Skillshare, etc. Lastly, do not miss your opportunity to plug in two external websites! The prompts will ask you to add your store link and blog link, but these can really be just about anything. 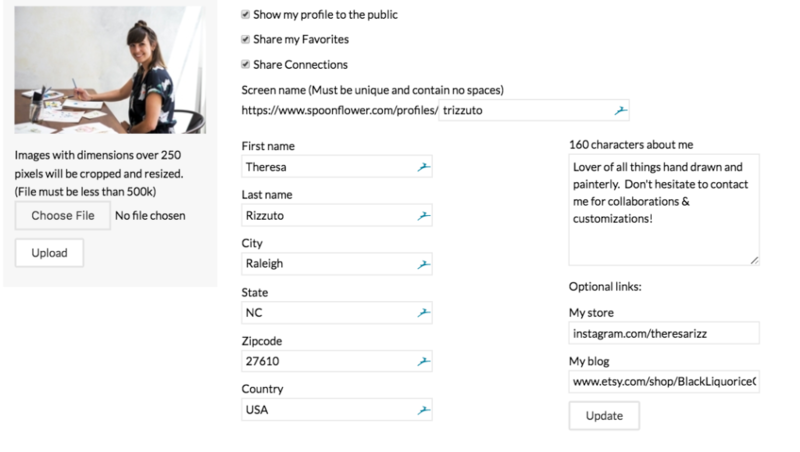 If you have an Etsy store or a personal website you want to share, this is the perfect spot to do so and gain a little extra traffic from people visiting via your Spoonflower shop. Many designers also use this spot to link their Instagram account, Facebook or Youtube channel. While you’re updating those two external links, don’t forget to add your city and country if you’d like! It makes our diverse community of designers more fun and interesting when we can see where everyone is across the globe. Once you’ve checked these important steps off your list, you’ll be well on your way to achieving seller success. Stay tuned for our next article in the Spoonflower Seller Handbook, where we talk about why you shouldn’t be sleeping on the Weekly Design Challenges, and how participating can help quickly increase your visibility and sales in the Marketplace. Looking forward to seeing the rest of the posts in this series. Thanks a bunch! 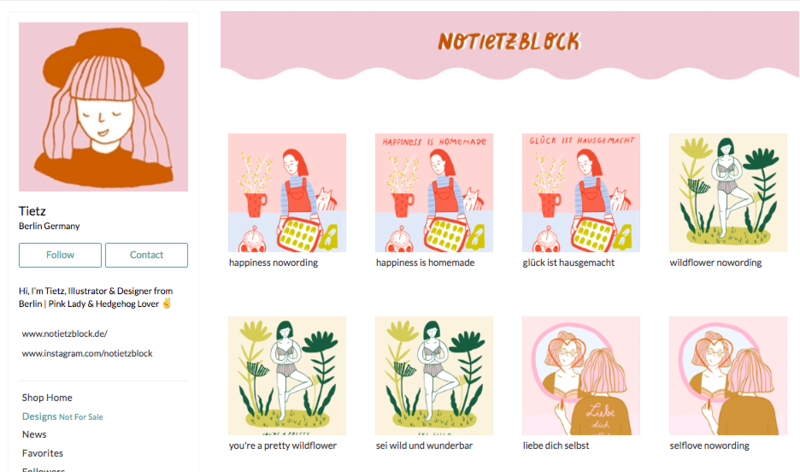 I’m interested in more tips from sellers and meeting more artists. 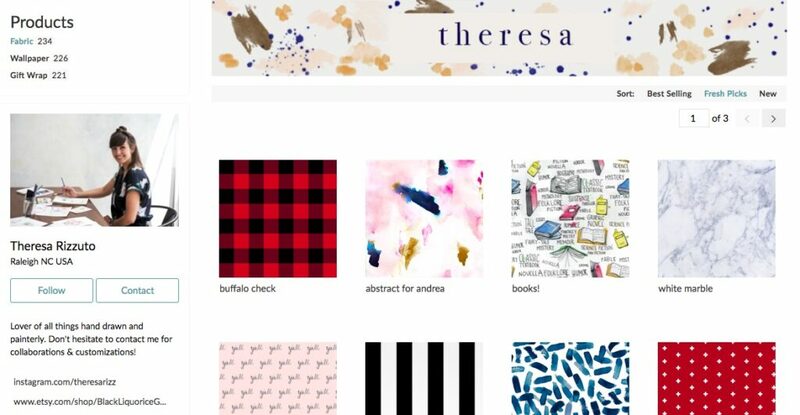 Placing 50 and above in a challenge helped me to get some exposure and a client, thank you Spoonflower! Looking forward to this year! Hi, how do I edit my Thank You message? 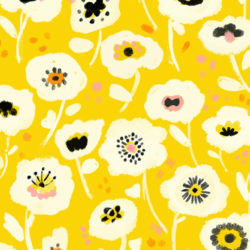 « The Spoonflower Small Business Grant: Apply Today!